" tag working when i tried to type it directly into either the questions and the options? I have translated my option answer to 3 language therefore i will have to separate each question into a new line but unfortunately i have only been met with failure to do so. It shows in the form builder but not in the actual form. If it's the matrix labels that you are referring to, it is working well here on my end. If this is not what you're having problems with, please provide us more details so we can further assist you. Hi yes, that was done by adding the paragraph tag before the sentence, the <\br> tag will work that way. But I am not able to do it without adding the "<\p> tag, however the paragraph tag would make the whole box look thick. Besides, the Br tag also doesn't work in this (screenshot) part, it shows on the form builder but not on the actual form. Each line break is currently done by manually adding the &nsbp tag and space until it would go to down to the next line. The br tag apprently only works when i wrap my text with the paragraph tag but in this case, it would mess up all my options alignment. I hope that you would be able to assist me in this problem, thanks. So, I think the best solution is to use the break tags along with the <p> tags as you already did some of your matrixes. 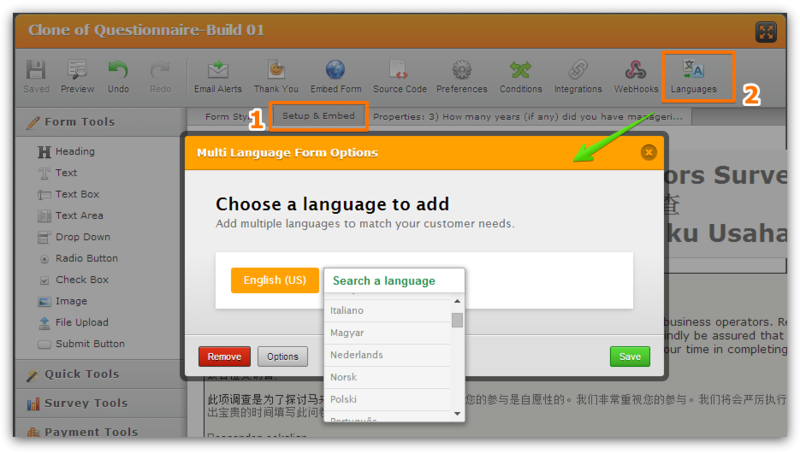 So, if you are using this method to make a difference between three languages, I think that you could save all this work by using our Multi Language Form feature. If you have not tried it yet, please do it, that may help a lot. That way your form users would have the capability to choose with of the three languages they wish to read/complete the form in. Please inform us if thishelps or if you need further assistance with this query. 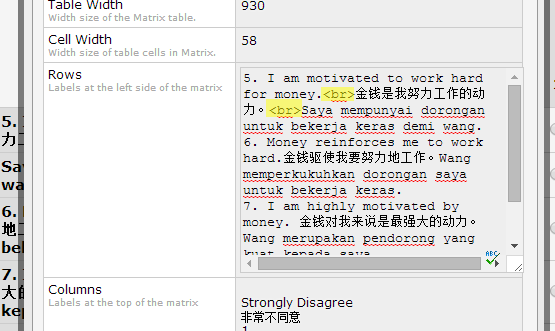 I was informed about the Multi Language Form feature, but since I would want the respondents to also be able to look at the original English language, i figure the best way to do it is by having all 3 languages in the same form. I figure i should just proceed with using the < p> tag for the matrix. But the < p> tag would not work with the radio button as it would mess up the the whole thing. Something that looks like this. I hope there's a way to solve this problem, come to worst case, I'll just manually adjust it LOL. You should not move to new lines the tags in your radio button options, Jw_Law. Moving paragraphs to new lines on Radio button options make it appear to look like that on your screenshot. If the problem persists on your end, please do provide us a link to the form in issue so we can have a look. I tested this on quick draft of your clone and it works. Please let us know of the result on your end. Please do NOT inject the CSS code I mentioned on your form. I just realised that it will removed the break tags you have added on the radio option items. It only help on the 1st item of each option. We will look for a better workaround. As in my case, i would want to use the br tag to separate each language of my statement to a new line so the code probably wouldn't work for me. I had also realise that the br tag doesn't work without the < p> tag. But by adding the < p> tag, it would have created a problem like what was shown in my image above. I still couldn't seem to find a way to do it other than doing it manually which would be a very time consuming work lol.